The flame test is used to visually determine the identity of an unknown metal or metalloid ion based on the characteristic color the salt turns the flame of a Bunsen burner. The heat of the flame excites the electrons of the metals ions, causing them to emit visible light. Every element has a signature emission spectrum that can be used to differentiate between one element and another. First, you need a clean wire loop. Platinum or nickel-chromium loops are most common. They may be cleaned by dipping in hydrochloric or nitric acid, followed by rinsing with distilled or deionized water. Test the cleanliness of the loop by inserting it into a gas flame. If a burst of color is produced, the loop is not sufficiently clean. The loop must be cleaned between tests. The clean loop is dipped in either a powder or solution of an ionic (metal) salt. 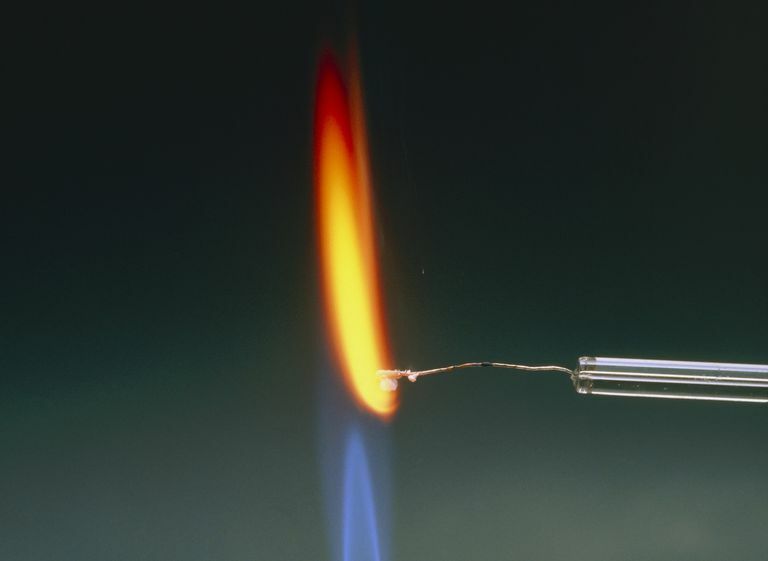 The loop with sample is placed in the clear or blue part of the flame and the resulting color is observed. Wooden splints or cotton swabs offer an inexpensive alternative to wire loops. To use wooden splints, soak them overnight in distilled water. Pour out the water and rinse the splints with clean water, being careful to avoid contaminating the water with sodium (as from sweat on your hands). Take a damp splint or cotton swab that has been moistened in water, dip it in the sample to be tested, and wave the splint or swab through the flame. Do not hold the sample in the flame as this would cause the splint or swab to ignite. Use a new splint or swab for each test. The sample is identified by comparing the observed flame color against known values from a table or chart. Carmine to Magenta: Lithium compounds. Masked by barium or sodium. Scarlet or Crimson: Strontium compounds. Masked by barium. Yellow-Red: Calcium compounds. Masked by barium. Intense Yellow: Sodium compounds, even in trace amounts. A yellow flame is not indicative of sodium unless it persists and is not intensified by an addition of 1% NaCl to the dry compound. Emerald: Copper compounds, other than halides. Thallium. Blue-Green: Phosphates, when moistened with H2SO4 or B2O3. Faint Green: Antimony and NH4 compounds. Azure: Lead, selenium, bismuth, cesium, copper(I), CuCl2 and other copper compounds moistened with hydrochloric acid, indium, lead. Light Blue: Arsenic and some of its compounds. Violet: Potassium compounds other than borates, phosphates, and silicates. Masked by sodium or lithium. Lilac to Purple-Red: Potassium, rubidium, and/or cesium in the presence of sodium when viewed through a blue glass. The test cannot detect low concentrations of most ions. The brightness of the signal varies from one sample to another. For example, the yellow emission from sodium is much brighter than the red emission from the same amount of lithium. Impurities or contaminants affect the test results. Sodium, in particular, is present in most compounds and will color the flame. Sometimes a blue glass is used to filter out the yellow of sodium. The test cannot differentiate between all elements. Several metals produce the same flame color. Some compounds do not change the color of the flame at all. Because of the limitation, the flame test might be used to rule out the identity of an element in a sample, rather than definitively identify it. Other analytical procedures should be conducted in addition to this test. This table lists the expected colors for elements in the flame test. Obviously, the names of the colors are subjective, so the best way to learn to recognize close-colored elements is to test known solutions so you know what to expect.